As an angler, one thing you're likely to notice is that there's always a tool you can use to capture more fish. One such tool, that's often underrated, is known as a fish finder. Basically, most fish finders use the latest Sonar technology to give you an in-depth look. And that way, you can know where to focus your efforts so you don't waste a whole day. Of course, that's by no means an exhaustive list of the features found in the latest fish finders. And, therefore, the review below is meant to help you familiarize with more of them. Want to see what's happening underneath the water? You don't need to be a scuba diver. By using the best budget-friendly fish finder you can always get an edge over everyone else. 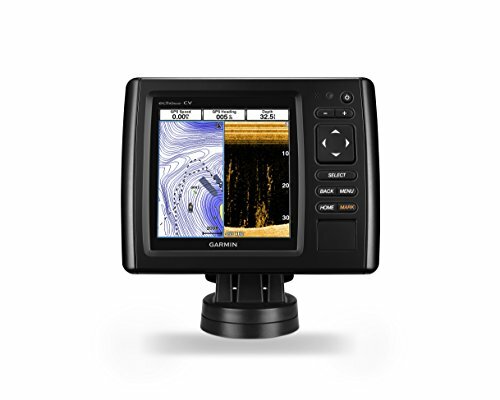 Humminbird Helix 5 has a lot to offer anglers. Its Chirp Dual Beam plus sonar technology give a wide range of data enabling you to make some high-quality finds. The GPS chart plotting feature is for marking waypoints and is, therefore, a great tool for finding your way around. 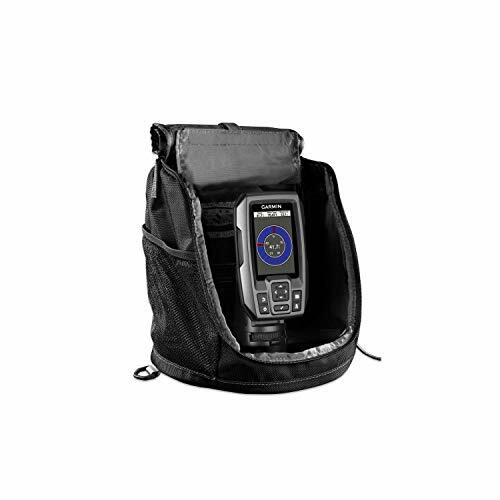 The fish finder features a WVGA 800 by 480 matrix, 5-inch color display. It has LED backlighting for night reading or reading when it is sunny. Thanks to the micro SD card slot, this fish finder has extra storage for additional maps, waypoints or other information. Garmin Striker 4 is very ideal for kayaks and small boats. The unit has a CHIRP 77/200 kHz sonar transducer and a GPS with basic navigation features. It is, therefore, possible to mark waypoints, but unfortunately, it has no charts. The 3.5-inch screen is big enough for observing fish targets and sonar beams and use the waypoint system. In addition, the LED backlight makes it sun readable and night readable. A purchase includes the CHIRP (77/200 kHz) transducer, a rechargeable battery, a carrying case, a tilt/swivel mount and transom and trolling motor mounting kit. 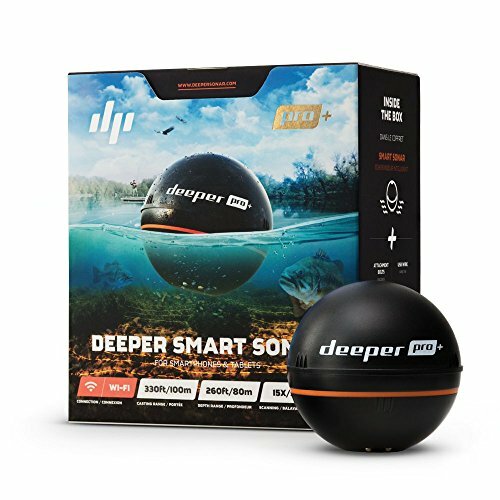 The Deeper-Smart Sonar is a unique fish finder with state of the art technology to maximize your fishing experience. It is excellent for both shore and offshore fishing, ice fishing, fresh water, and saltwater fishing. It is a castable sonar, constructed in a ball shape with a built-in GPS and wi-fi. It is quite easy to connect to your device and requires no internet to operate. Garmin 53cv is a perfect fish finder for both fresh and saltwater fishing because of the power of its CHIRP. 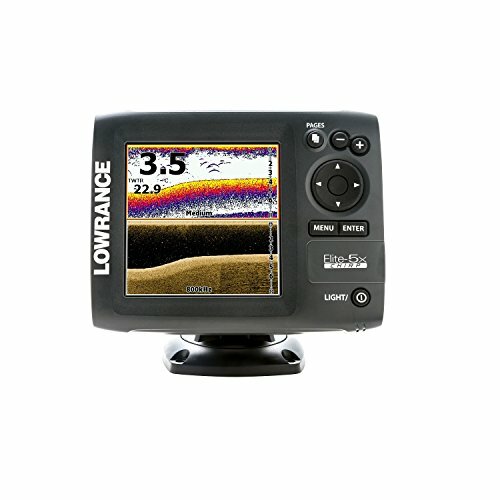 The fish finder is excellent for small and medium-sized boats. The fish finder comes with a very effective GPS system and a scanning sonar chirp system. It is also preloaded with maps and can accept additional maps. The WQVGA-color display, 5-inch, 480x480-pixel is a moderate size to offer good quality images. 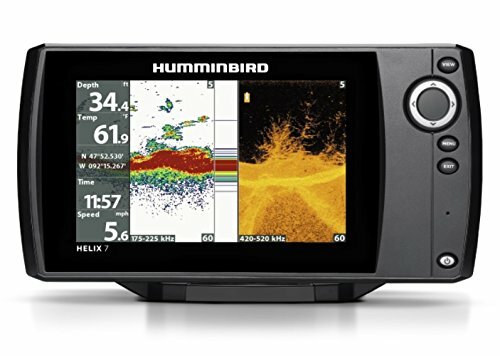 Humminbird Helix 7 is quite a functional fish finder that will enhance your fishing experience. It features a color display 7-inch screen with LED backlight for both night and sunlight readability. It has CHIRP technology. It also has a built-in transducer for sonar detection and even water depth and temperatures. It is unfortunate that the unit doesn’t come with a GPS or any navigation system. 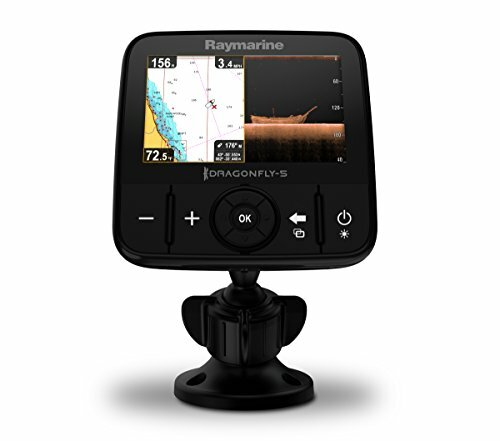 Raymarine Dragonfly combines many features in one fishing unit to guarantee you more catches. The unit comes with naviotics, charts, wifi, and a GPS. The screen is an Optically bonded LCD display for bright images with LED backlight for sunlight or night viewing. It comes with a GPS and also the capacity to save waypoints. The Chirp down vision offers good photo-like underwater sonar views. You can streamline fishing data on your smartphone and share with other fishing buddies, because of the wife feature. 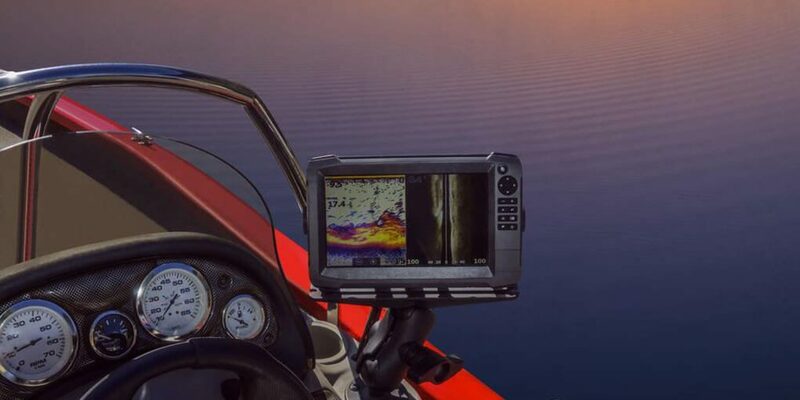 Lowrance Elite-5X blends Down Scan Imaging with Chirp sonar for better target fishing. Though it is a basic fishfinder without a GPS or mapping system, offering no tracks, routes or waypoints, it is a very effective fish finder. The Chirp sonar marks fishes clearly even at high boat speeds while the Down Scan Imaging technology provides photo-like images. The fish finder has a 5-inch high-resolution color display screen with LED backlight for superior quality imaging even at night or when it is sunny. Included is a transom mount electrical device. The kind of display screen you settle for can significantly affect your user experience. For that reason, you'd better off settling for a fish finder with a significantly big display screen. It should also be backlit for an easy time viewing it under the glare of the sunlight. The transducer is the main device that a finder uses to capture Sonar wave signals. In other words, if you get one that's of high-quality, you'd be best placed to make a catch. Basically, the signal generated by the transducer is what is then converted into an image. So, don't cut corners. We'd recommend going for a high-quality transducer which can help you make some highly-informed decisions. Normally, if the frequency is high, you get better chances of capturing more detailed shots. Ultimately, the kind of frequency you settle for should be determined by the depth of the water you're fishing. If venturing into the deep waters, we'd recommend going for a 50 KHz frequency level. As for shallow water surfaces, a 200 KHz would suffice. 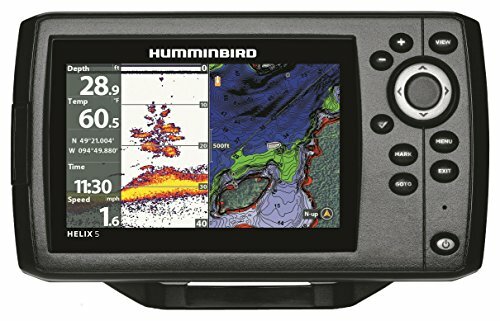 In our opinion, the best under 400 fish finder is the Humminbird Helix 5 GPS 410210-1Chirp G2 Fish Finder. It has a pretty well-made transducer, a high-level of frequency and a backlit screen. We generally, feel that it offers a better deal than everyone else that is. It's high time you start approaching the deep waters with confidence. And as it turns out, it takes more than just the usual fishing gear to get things done. That's why you need to find the best fish finder for the money.